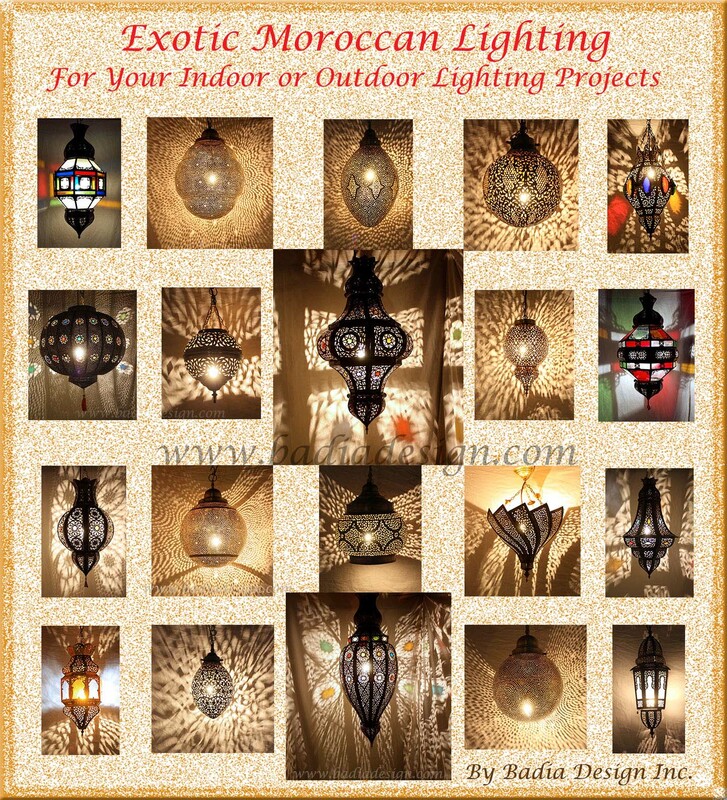 Badia Design Inc. has some of the highest and best quality Moroccan Lighting in the US. If you are looking to Moroccan Home Lighting Ideas to spruce up your home or office then http://www.badiadesign.com is the place to visit, either our online store or our 32,000 square foot warehouse located in North Hollywood, CA. Badia Design Inc. has a wide variety of Moroccan High End Lighting which includes chandeliers, lanterns, wall sconces, pendant lights made of brass, glass and zinc. Please visit http://www.badiadesign.com to see a full list of our Moroccan High End Lighting Store. Badia Design Inc. has some of the most Extravagant Moroccan Lighting in the United States with many different designs and colors to choose from to include chandeliers, pendant lighting floor lighting, brass and silver lanterns, lamps and wall sconces. Most of our lights are made for indoors but some can be used outdoor as well. You can fully decorate your living room, dining room or just about place in your home or office. Badia Design Inc. provides lighting for just about any event such as parties, weddings, get-togethers of any kind, graduations, etc. We also provide our lighting to the movie and television industry for either sales or rentals. Our lighting has been featured in many productions such as True Blood, End of Days, Criminal Minds, CSI, NCIS, Desperate House Wives, Iron Man, Lord of the Rings, Game of Thrones and even the Oscars held in Los Angeles. If you are looking for lighting to decorate your living space or office then Badia Design is the place to visit. 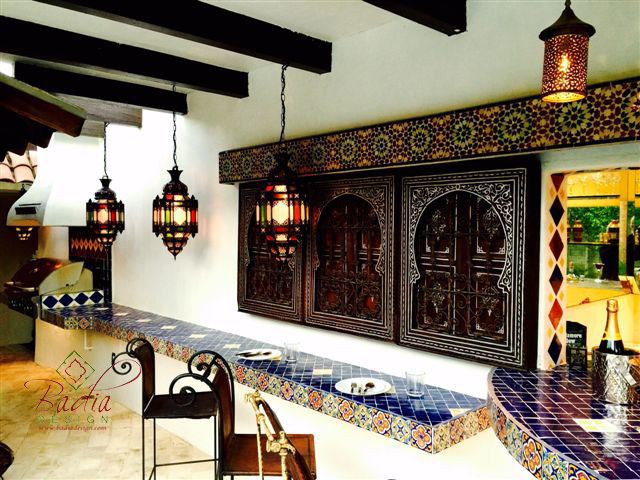 Badia Design Inc. – 818-762-0130 | Badia Design has the largest supply of Moroccan Patio Lighting in Los Angeles from outdoor, indoor, brass, rustic, glass, silver, chandeliers and much more. We can help you beautify your patio, home or office; indoor or out with our beautifully hand designed lights. 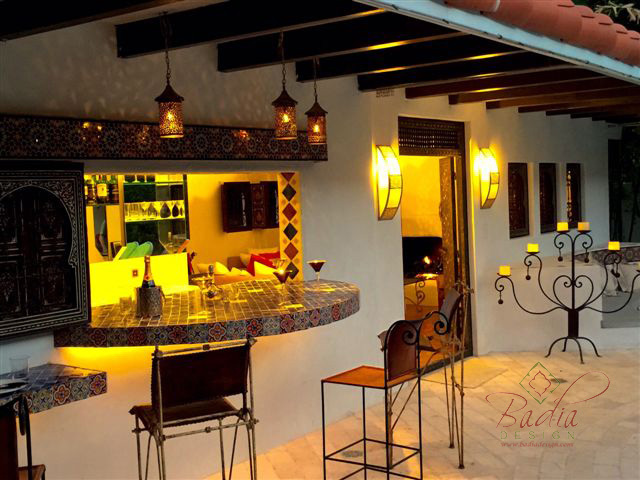 If you are in need of Moroccan Patio Lighting Ideas then please contact Badia Design Inc. for assistance. Moroccan Rustic Iron Wall Sconce from Badia Design Inc.
Badia Design Inc. – 818-762-0130 | We have the largest supply of Moroccan Rustic Iron Wall Sconces in the United States. Hand-tooled with Traditional Moroccan Floral Patterns and Geometric Cutouts. A focal point for entryways, rooms, bedrooms, bathrooms or empty corners. It adds a uniquely foreign touch to your home! To view our full line of Moroccan Rustic Iron Wall Sconces please visit http://www.badiadesign.com/moroccan-lighting.